Veterans/First Responders Program: "Freedom Fridays"
The Freedom Steps Equine Services for Heroes program is specifically designed for those suffering from Post-Traumatic Stress Disorder (PTSD), Compassion Fatigue, Secondary Traumatic Stress (STS), TBI and/or other injuries that can happen in the line of duty. Classes are held on Friday at 4 and 5 PM. 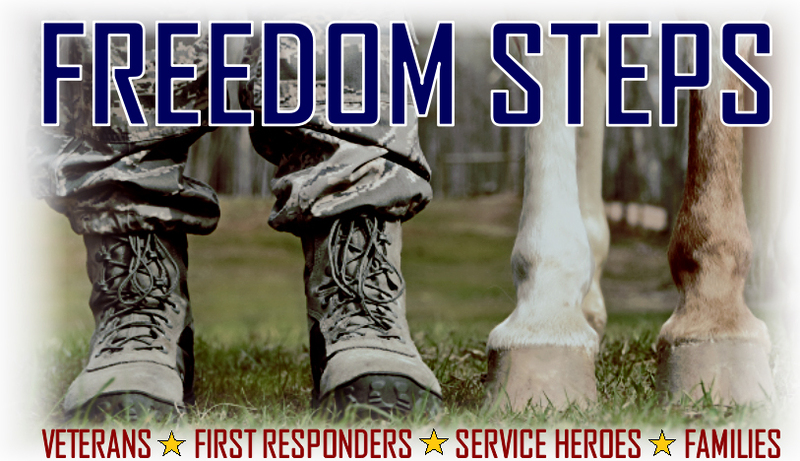 Freedom Steps offers Equine-Assisted Activities and Therapies (EAAT) from a PATH certified instructor to Military Veterans, First Responders, Community Heroes and their families. Our 70+ acre property provides a tranquil environment for both unmounted and mounted sessions in a large outdoor arena or smaller 'classroom style' setting. Individuals benefit from equine therapy as it restores a sense of self, helps renew their quality of life and can assist an entire family to regain hope for the future. 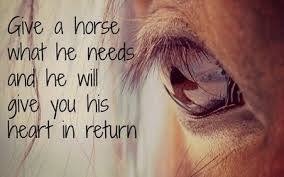 We believe in using the horse as a modality to improve and change lives for those who have fought for our freedom! Freedom Steps is a PATH Int'l (Professional Association of Therapeutic Horsemanship) riding program at Fuzzy Faces Refuge, offering private or semi-private riding lessons for children and adults with a variety of special needs. Our purpose is to provide a therapeutic experience for each rider by combining riding skills with games and activities to enhance strength, balance and maximize potential while having fun! Freedom Steps offers Therapeutic Riding from a PATH Int'l certified instructor on our 70+ acre FFR property with the goal of restoring a sense of self, renewing quality of life and helping to regain hope for the future. Our animal interaction programs are designed to provide positive therapeutic experiences for children and adults with the goal of building confidence, enabling positive progress and affording opportunities that may otherwise be unavailable. There are many articles written and opinions rendered regarding Animal Assisted Therapy. But whether it be therapeutic riding, equine, canine, farm animal or small animal assisted therapy, the benefit to humans is evident. For those who can’t have their own animal, we offer on-site, hands on therapy in a family oriented, homestead setting. We are committed to educating the public on the proper care of animals, whether they be companion animals or farm animals. If we want our animals to thrive, then it’s essential that each of us know what is a best practice for each species. With this goal in mind, we have developed hands on therapeutic animal care experiences. Some simple guidelines that you can begin now are to monitor the weight and regulate the diet of your animal to prevent health issues, sterilize your animal if they are not a critically endangered species and groom and keep your animal in a clean environment. The saying that there is strength in numbers is never more appropriate than in the world of animal protection and inclusion for persons with special needs. Each of us is part of a family and a network, either the one that we were born into or one(s) that we have chosen to be a part of. That makes each of us a messenger for our small part of the world. When we can create meaningful bonds of cooperation between our networks, then we can maximize our reach beyond what each group or person can do alone. Each of us has a special mission or vision that can overlap with the other such that working together in our areas of strength, we CAN change the world! 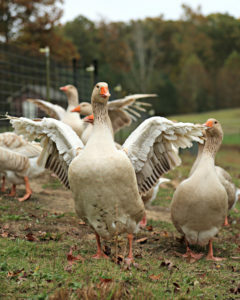 We are committed to selecting gentle, critically endangered livestock and poultry that are in danger of extinction. Several of these are the Morgan Horse, Spanish Mustang, Saxony Duck, American Chinchilla Rabbit, Holland Chicken, San Clemente Goat, just to name a few. Interaction with both children and adults is beneficial to the fuzzy residents here at the Refuge. By offering opportunities for education, therapeutic interaction and adoption of these animals, we will ensure their continued survival while providing lasting memories and an understanding of the importance of preserving our heritage breeds. Each animal, whether a non-critically endangered species or a critically endangered species, is provided with the best care possible! This care includes learning how to relate to humans whether they have special needs or not. Proper physical and emotional care is essential for all animals and we make sure that all of our fuzzy residents are well fed, groomed, vetted, spayed or neutered (if not critically endangered), kept in a clean environment, trained and loved. Not only by their caretakers; but, by the entire Fuzzy Faces Family of Volunteers and Clients! There is nothing more unconditional than the love each of us receives from an animal companion. Domesticated animals depend on us to meet all of their needs, just like children. Therefore, any animal adopted from Fuzzy Faces Refuge can depend on being loved and cared for properly for the rest of their life. If an adoptive family is no longer able to keep and care for their Fuzzy Faces Refuge friend, then the animal will return to the refuge. We owe so much of our happiness to our fuzzy companions that we feel it’s their right to come back to the loving arms of the Fuzzy Faces Family. Animals love interacting with humans! And, humans love interacting with animals! What better way to create mutually satisfying experiences than with meaningful interactions that build joy for both partners. Animals just seem to know when there is something different about a person. They are curious and want to help. They listen without judgement, eagerly await the next job to do, the next adventure or the next activity in the company of their human companion. Animals love our attention. We make each others lives complete.